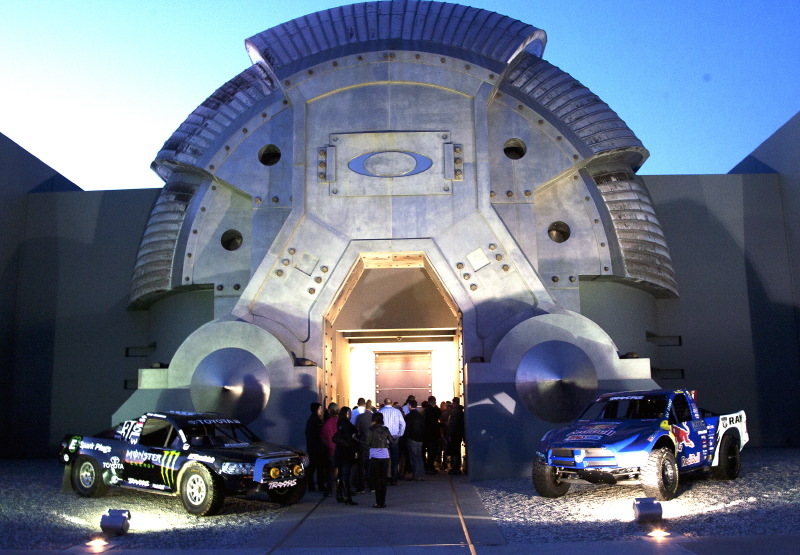 March 8, 2012 (Foothill Ranch, Calif.) – Set against the uniquely sculptured and dramatic backdrop of Oakley’s world headquarters, the finest off-road motorsports performances of last season were toasted at the annual Dirt Sports magazine “Driver of the Year Honors” celebration hosted by Amsoil, KMC Wheel, Oakley, Red Bull and Ryan Communications Group (RCG). 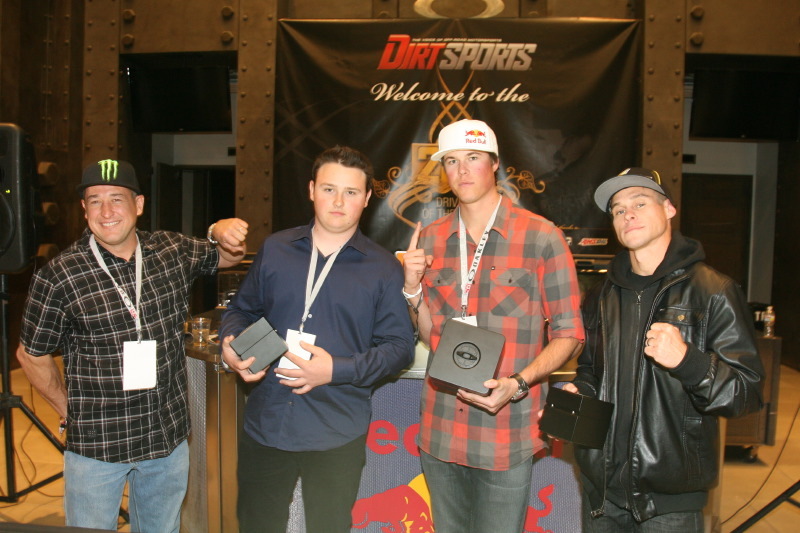 In the most difficult and closely contested Driver of the Year voting since the awards were established in 2005 (for the 2004 season), Dirt Sports gave top 2011 honors to Bryce Menzies. Menzies, a 24-year old racer from Las Vegas, managed the nearly incomprehensible feat of claiming two very distinctive championships; the Traxxas TORC Pro 2 unlimited short course title and the SCORE desert series Trophy-Truck crown. Both categories are considered the pinnacle in their respective forms of off-road motorsports. Enroute to his twin championships, Menzies also piloted his Menzies Motorsports-prepped RAM Trophy-Trucks to overall victory at the SCORE Laughlin Desert Challenge and the Tecate SCORE Baja 500, a performance that also earned him SCORE “Rookie of the Year” honors. In the heated, door-to-door world of TORC competition, the talented young champion also took home “Rookie of the Year” accolades via seven series wins and six Oakley “Bomb Awards” for fastest race laps. For 2011, Menzies Motorsports was made possible by corporate partnerships with Red Bull, RAM/Mopar, BFGoodrich Tires, KMC Wheels, Amsoil, Traxxas, Oakley, Bosch Power Tools, Fox Shox, Eibach Springs, Motive Gear, K&N Filters, CBR and Race Proven. While the determined Menzies earned top honors, his selection was made much more difficult thanks to the outstanding season laid down by Lucas Oil Off Road Racing Series (LOORRS) racer and extreme athlete Brian Deegan who was honored as the “Short Course Driver of the Year”. The cross-over star not only fought his way to a LOORRS Pro Lite title, but he also beat out the highly competitive Pro 2 field to earn the LOORRS Pro 2 crown in his rookie season in that category. The performance produced both “Rookie of the Year” and “Driver of the Year” honors for Deegan by LOORRS. Proving his talent, he also took the Rally Cross gold metal at the 2011 X Games. The enthusiastic winners were honored by RCG President Jim Ryan and company Editorial and Marketing Director Marty Fiolka, at a gathering Oakley’s world-class headquarters and presentation theater. Additional highlights included speeches and presentations by former Dirt Sports Driver of the Year winners Carl Renezeder and Heidi Steele. All honorees were awarded a custom-made presentation box by Oakley featuring a specially engraved watch and high performance sunglasses. The evening also included a touching tribute for 2010 Driver of the Year Rick Huseman, who passed away last season in a tragic plane crash. Michelle Huseman, Rick’s wife, was on hand to address the attendees and emphasize how much the Dirt Sports award meant to her late husband. In choosing each of their past winners, the panel of judges made their final determinations based upon drivers posting a championship performance, their ability to represent both the sport and sponsors in a professional manner, and their ability to rise above significant competition as a racer.